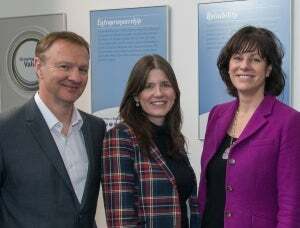 Claire Perry, the Conservative MP for Devizes and Parliamentary Under-Secretary of State for Transport, visited the UK headquarters of Knorr-Bremse in Melksham, Wiltshire, on 13 February. Claire was invited and accompanied by fellow Conservative and Prospective Parliamentary Candidate for the Chippenham constituency, Michelle Donelan. Claire and Michelle met with members of the senior management team at Knorr-Bremse UK and also had the opportunity to tour the facility and talk with many of the employees based there. Melksham carries out research and development, design and engineering and also the manufacture of sophisticated rail systems. In addition to demonstrating strong growth in its UK business, the company has been very successful in export markets especially in the Middle East and China. Recently, Knorr-Bremse UK has won a number of major, multimillion pound UK rail contracts, including braking systems for the new Hitachi Class 800/801 Intercity Express trains and the new Bombardier-built Crossrail trains for London and for the supply and installation of a platform screen doors system for every platform on the Crossrail line. Paul Goodhand, managing director of Knorr-Bremse Rail UK, commenting on the visit said: "It was a great opportunity to meet with Claire and Michelle and to be able to discuss both current and future global and national rail business issues ‘in the work place.’ Because Claire and Michelle are both ‘neighbours’ of our Melksham facility we were also able to usefully discuss more localised issues too." Claire Perry MP added: "Rail is a vital part of our long-term economic plan and our record investment of £38bn to 2019 is being felt across the country. The benefits are being felt directly by passengers but also throughout the supply chain at companies just like Knorr-Bremse UK. "I was delighted Michelle invited me to be here to see the great work that is being done in the Chippenham constituency and exported worldwide." Michelle Donelan commented: "Knorr-Bremse Rail UK is at the forefront of research and development for sophisticated rail systems. They are a great local and national employer. The company is a great success story. So much so that it has doubled in size over the last two years, which bespeaks of the hard work and determination at being a world leader in its field. Knorr-Bremse now employs over 400 in Wiltshire. We need to support companies like Knorr-Bremse and encourage more into our area to create more jobs for local people. "From this great constituency, Knorr-Bremse exports its products and talents world wide and throughout the UK." For more information, please contact Knorr-Bremse.